We’re a multi-cultural radio station transmitting from the offices of the San Antonio de las Huertas Land Grant in the heart of Placitas, New Mexico. Licensed by Las Placitas Association, KUPR's coverage area includes Placitas, Bernalillo, Algodones, parts of Rio Rancho and the Pueblos of Santa Ana, Zia and San Felipe. KUPR is streaming - join listeners from around the world and enjoy all the unique programming from KUPR 99.9 FM, Placitas, New Mexico, USA from your phone, tablet or computer. ​Those of you already listening to music over the internet using other applications should have no problem finding us. Thank you for a successful fundraising 2018 - meeting our operating fund goals and setting aside a few dollars to begin renovating the mobile office that will be KUPR's new home in 2019. Yes, that pink elephant parked next to the San Antonio de las Huertas Land Grant building will soon be moved into place, spruced up inside and out and provide much needed expansion space for KUPR. The building renovation will expand our studio, enhance our programming and community involvement and provide space for live music. There is much to be done to make this happen, but with your support it will be a reality. For our first fundraiser specifically for building renovation in 2019 - KUPR goes Western - The Cowboy Way - at Anasazi Fields in Placitas on Saturday, April 20th - 1-4 pm - save the date. Line up includes the award-winning "The Cowboy Way" in concert, silent and live auctions and more. Tickets on sale now at Brown Paper Tickets and soon at the Merc in Placitas and Kaktus Brewing in Bernalillo. See you there. Celebrating a musical legacy that is timeless, The Cowboy Way is the award-winning trio of Jim Jones, Doug Figgs and Mariam Funke. 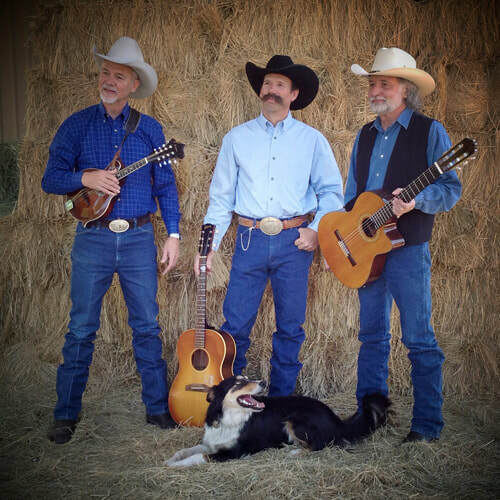 Enjoy tight harmonies, high energy and smoking instrumentals that will have you boot scootin’ and toe tappin’ all afternoon. WINNER 2017 Western Heritage Wrangler Award Western Album of the Year.